Hello, dear Randi! I am SO excited about your poetry. I love fairies too--and your wonderful poetry inspires me. Hi! 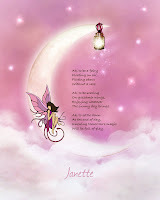 I came over from Beth's Artworx - I have had a delightful time reading through your fairy poems! I think you have been sprinkled with a little wonderful fairy dust yourself! These are beautiful - and I really do hope you publish them someday!